This is such a funny party game, everyone will be laughing and taunting in no time. It works well for all ages, from 7 years up to 70. "they laughed so hard they couldn't talk"
"how many funny games do u hav im cryin from laffin so much"
"my grandma loves this game!" Set up the chairs at least 5 feet apart facing the same direction. Place a bowl on each chair. In one bowl, place all of the cotton balls. Take the first player and blindfold him/her. Now turn them around a few times and place them in front of the chair with the cotton balls. Place the large spoon in one of their hands and place the spoon on the edge of the bowl with the cotton balls (just to give them an idea where it is). Set the timer for a specified time. About a minute is good: depending on the ages of the participants. 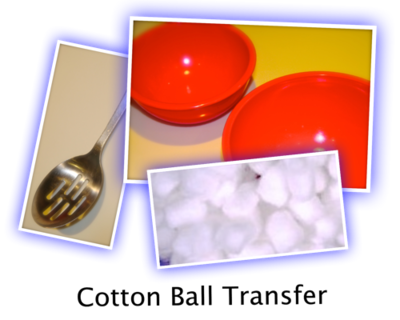 Say "go" for them to begin scooping cotton balls into the spoon and place them into the empty bowl on the other chair. At the end of each player's turn, count the cotton balls that actually made it INTO the opposite bowl. Keep a tally on paper until all players have had a turn. The one to transfer the most cotton balls successfully is the winner. It doesn't sound like much, but have you ever tried to scoop up anything blindfolded that you can't feel or see? It's a hoot to watch them gingerly carry the "cargo" from one pot to another and not know that there's nothing on the spoon! The best way to end the Cotton Ball transfer game is to trick one person (with a good sense of humor) and take away all the cotton balls in their bucket...so they THINK they are transferring something and they're NOT. Hilarious! I set this up for my girls to try as a test.....They loved it! This was awesome! Played it for my daughter's 10th bday party so funny everyone loved it! Thanks for great game idea! I know right my daughter and her friends were laughing so hard they couldn’t talk! It sounds like so much fun, we will for surely be playing this one. i loved the additional idea!!!!!!! I laughed so hard, I wet myself. I LOVED THIS GAME IT WAS SO COOL! I am having a sleepover with 5 pre-teens and 2 teens! this seems like an awesome game for the occasion!Yay! this will be awesome i hope!!!!!!!!!!!!!! This game sounds so much fun!! !I can't wait to play it! looks like fun! I can totally see me and my friends doing this. We are having the Ultimate Sleepover Volume 2 we have one every year. But we started last year. So this is going to be so muchfun. Its a big slumber party so I see this working well with all of us. me & my friend are thorwing this huge slumber party. I think that this would be a great game for us to play. haha I cant wait to try this with my friends! I bet my friends are going to have a hard time chalening this game!! my grandma loves this game!!! Love this game sooo much ... even though have not tried it yet!!! lol..
sounds great!!! you could even have two people doing it for a race ! Sounds totally cool! I am going to try this at our yoth group parties! Sounds like a good game. I'll try it on my teen group. I did it at a friend's surprise party last weekend..it was soo much fun! Everyone was laughing so hard. Thanx! I have heard of a different version of this game. It is where you spread the cotton balls all over the floor, and have them put it into a bowl. Wow i would have never thought of that. i will use it as my lil sis's 13th birthday party and let you know how that went k? Thanks for the idea! sounds like alot of fun and laughing! My son's 13th birthday is Sat. I can't wait to try this game. Thank you for the idea! this sounds like a fun game for my party! im ganna try it! i wanna try this! sounds really hilarious n cool! that sounds like an absolutely hilarious game! i can just see my friends trying to do this! i cant wait to try it at my party next month!